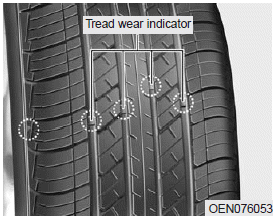 If the tire is worn evenly, a tread wear indicator will appear as a solid band across the tread. This shows there is less than 1/16 inch (1.6 mm) of tread left on the tire. Replace the tire when this happens. Do not wait for the band to appear across the entire tread before replacing the tire. • The ABS works by comparing the speed of the wheels. The tire size affects wheel speed. When replacing tires, all 4 tires must use the same size originally supplied with the vehicle. Using tires of a different size can cause the ABS(Antilock Brake System) and ESC(Electronic Stability Control) to work irregularly. A compact spare tire has a shorter tread life than a regular size tire. Replace it when you can see the tread wear indicator bars on the tire. The replacement compact spare tire should be the same size and design tire as the one provided with your new vehicle and should be mounted on the same compact spare tire wheel. The compact spare tire is not designed to be mounted on a regular size wheel, and the compact spare tire wheel is not designed for mounting a regular size tire.